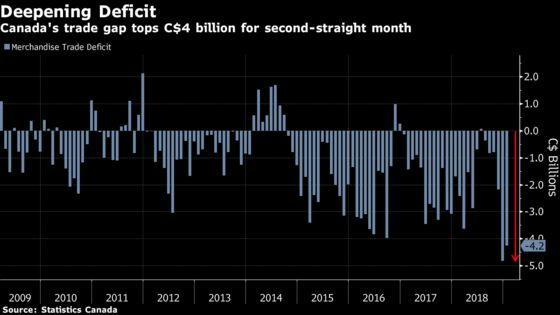 (Bloomberg) -- Canada’s merchandise trade deficit narrowed as oil prices rebounded at the start of the year, though the gap remains the second-largest ever. The nation posted a C$4.3 billion ($3.2 billion) shortfall in January, down from December’s record high gap of C$4.8 billion, Statistics Canada said Wednesday from Ottawa. Until December, Canadian deficits had never exceeded C$4 billion. The monthly trade gap has averaged about C$2 billion over the past four years. The rapid deterioration in the country’s trade picture reflects plunging oil exports, as crude prices collapsed at the end of last year, as well as stagnant exports in the non-energy sector since mid-2018 -- adding to the nation’s growing list of economic headwinds. While Canada’s total exports jumped 2.9 percent in January as oil rebounded, the increase is only the first in Canada’s shipments abroad since July. Exports in January were still down 7.3 percent from record highs in July. The slump in exports was one of the main reasons why Canada’s economy practically stalled in the final three months of 2018. The combined C$9.1 billion trade gap in December and January was by far the country’s largest ever two-month shortfall, surpassing the previous record of a C$7.5 billion two-month deficit in 2016. A 37 percent increase in the value of oil shipments drove the export rebound in January. That gain was almost entirely due to rising crude prices, which recovered some of the losses from the final three months of 2018. In volume terms, crude exports were little changed, reflecting mandatory output curbs imposed by the Alberta government at the beginning of this year. Total export volumes -- including all sectors -- recorded a 0.9 percent gain in January. Imports rose by 1.5 percent, with all the gains reflecting increased volume. Import volumes growing more quickly than export volumes suggests trade was a drag on real growth measures in January. Economists anticipated a sharper narrowing in the trade deficit in January, forecasting a decline to C$3.6 billion. There was some bright spots in the report. For one, it highlights the transitory nature of the impact from last year’s oil price plunge. Non-energy exports also posted an increase of 1.2 percent in January, the first significant pick up in three months. At the same time, there are concerns the pace of gains in January won’t be sustained given global weakness, economists said. “Canadian exporters are swimming against the tide of a softening global industrial sector, slower global trade growth, and a U.S. manufacturing sector whose growth appears to have peaked last year,” Nye said.